The new eco-thriller, “A Dark Truth,” sensationalizes contemporary conflicts over water rights and environmental justice in Latin America, and disrespects the popular movements that are the main protagonists of those struggles. “Escape the jungle, expose the truth!” is the teaser for a new eco-thriller coming soon to a theater near you. Featuring Andy Garcia, Forest Whitaker, and Eva Longoria, “A Dark Truth” tells the story of a fictional multi-national corporation (ClearBec) that instigates a peasant massacre in a South American village, to cover up a typhus epidemic after inadvertently poisoning the water supply that has been privatized under its control. 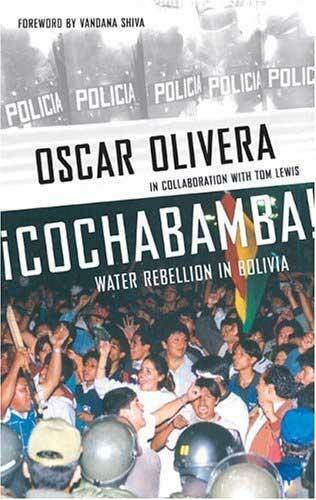 Unfortunately, despite its subversive pretensions, this film sensationalizes and over-simplifies the contemporary conflicts over water rights and environmental justice in Latin America that it purports to represent, and disrespects the popular movements that are the main protagonists of those struggles. The plot is thick with family and political intrigue (spoiler alert). A corporate daughter who is a major shareholder blows the whistle on her CEO brother, sending an ex-CIA operative-turned-political-talk-show-host (Jack Begosian) south of the border to investigate. Begosian rescues peasant leader Francisco Francis from the jungle, carrying documentary evidence of the corporate misdeeds—an act that redeems Jack's own transgressions from his CIA days, when he framed Francis as an ecoterrorist and sent him to prison for more than a decade. Two suicides, several brutal murders, and many throat-slittings later, Francis makes a guest appearance on Begosian’s talk show to denounce the evils of water privatization. The corporate sister steers ClearBec in a new accountable direction, after her evil brother is indicted for murder conspiracy (and becomes one of the two suicides). All seems right with the world. Except for a few major problems. Strikingly, all the heroes of “A Dark Truth”—including the ex-CIA agent, the corporate whistle-blower, and the assassin hired to kill Begosian who experiences a change of heart—are North Americans. Even Francisco Francis, the fictional dark-skinned peasant leader, is portrayed as a San Francisco native with a PhD in environmental studies who came to South America as a Greenpeace activist and then went on to found the (real-life) international peasant organization Via Campesina. Despite these glaring omissions, director/writer Damian Lee claims to have been inspired by the “real-life South American water wars, which happened when a major multinational corporation bought up the water rights in a couple of countries” (sic). In a post-screening discussion at the Boston Film Festival last fall—where he was voted best director—Lee referenced Peru as the country in question and seemed nonplussed when an audience member suggested that the events actually occurred in Cochabamba, Bolivia. Factual inaccuracies aside, Lee has gone to great lengths to blur the boundaries between fact and fiction in an effort to titillate his audience. As the film credits roll, viewers learn that they have witnessed a “dramatic interpretation of true events, based on hundreds of media accounts…as well as interviews with many of those involved,” although “some of the actual names have been changed, certain events and characters have been fictionalized, and some timelines have been condensed for dramatic purposes.” In Boston, Lee suggested that the character of Francisco Francis was “an amalgam of several true-life eco-warriors.” The fictional ClearBec corporation is obviously intended to evoke associations with Bechtel, the infamous transnational that was ousted from Bolivia. Lee's manipulative tactics appear to have succeeded in Boston, where the youthful festival audience received “A Dark Truth” more enthusiastically than one might have expected. Perhaps the film resonated with their innate sense of social justice and their distaste of corporate greed, even though it thoroughly obscures the reality of how social change is accomplished through popular movements. And perhaps Damian Lee should follow the example of his fictional character Francisco Francis, who donated all the profits from his best-selling book, written in prison, to Via Campesina. How about it, Damian?